Here we continue in the Kakheti region, with its reputation for great wines and great food. The family is famous for Ilia C. who was a great poet of the 19th Century. The house in the town of Tsinandali is something to see. Although the tour is done in Georgian, it is worth taking. The grounds are very nice too. It is calm and interesting. 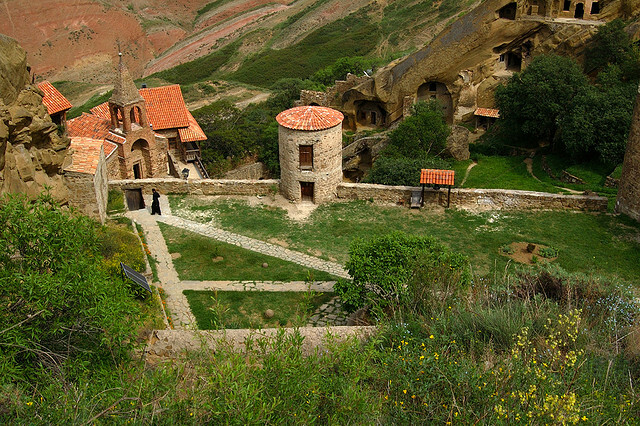 David Garedja Monastery. I personally love the second pic...Now, that is monastic! If I were a monk, which of course is not likely to happen soon...this would be my house! I think that looks like a great house for a hobbit! Kakheti is famous for its wines. 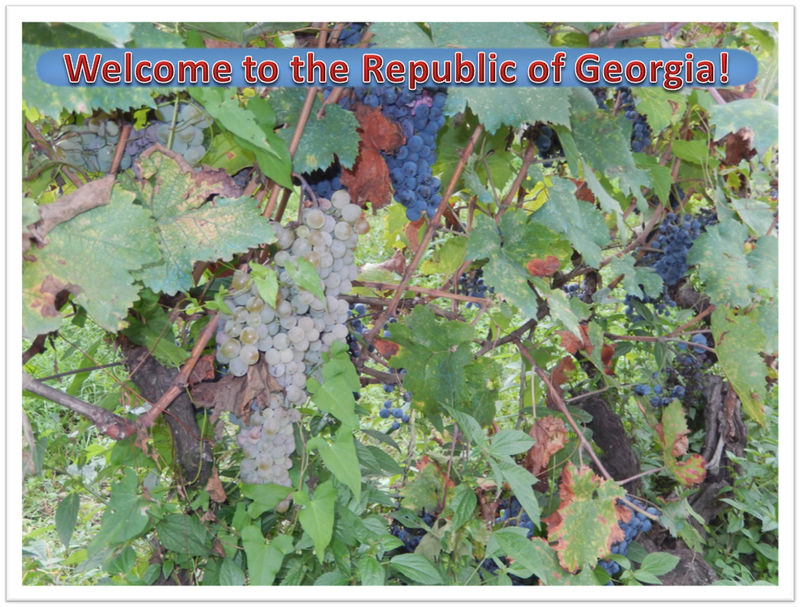 They say that wine originated in Georgia, with grape stocks dating millennia! Here is a fun rendition of the Georgian passtime. 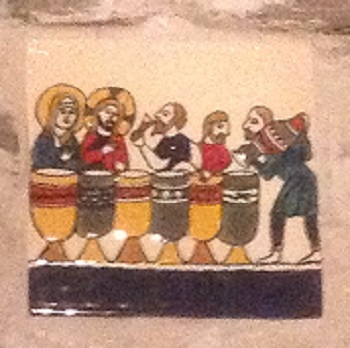 As seen on the wall of the wine cellar of the Chavchavadze Princes residence in Tsinandali. Here, you see the place where the princes would enjoy the wine, right in the cellar. The storage of the bottles in quite interesting, too. These bottles are too close to the general public to be valuable, no doubt. 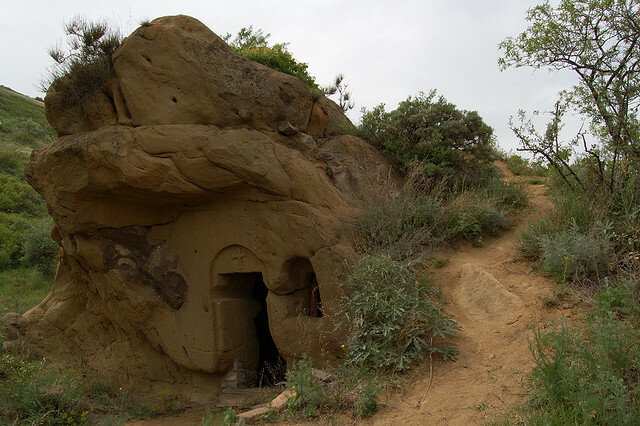 In ALAVERDI, a few miles from Telavi, the Monastery is a wonderful place to visit. It is very quiet, in the middle of a great valley, and surrounded by the Caucasus Mountains. The monks live there in peace, so you will need to be respectful, and to dress accordingly. No pants for ladies, no shorts, no tank tops for anyone. They do have "coverings" for those who do not have the proper clothing. If you are a lady, you are supposed to cover your head in the cathedral. It is really a very beautiful place. It has suffered much from an earthquake in 2002, and since it is several centuries old, it is menacing to fall down, if no restoration is coming soon. The frescoes inside are incredible. I admit I took them as no one was present, but it is not allowed. May I be forgiven for that..The rest of our day was trying enough to make up for that transgression, I think.. The orthodox monks are quite self-sufficient. They have planted olive trees, and here, peach trees, where bees make honey below them. Think of how great the honey is going to taste. They have grapes, evidently, for they are well known for their making of wine. The monks no longer give tours to their inner courtyards, but you can see large clay pots or qvevri in front of their living quarters. They also grow veggies. A big recommendation for this magnificent monastery, one of the main stops in Georgia. In TELAVI, Pirosmani is a good restaurant with regular prices and visited by locals, it seems. It is in the center of town, on the way to the Persian Castle, on the left. It is a doukani, and is below the street level. Enjoy a great meal, and a great Georgian beer! Make sure to visit SIRNARI, sometimes written "Sighnaghi". Although the Georgian government is trying to make it the mecca of tourism, and the only place to go in Kakheti, it is placed in a very interesting region, high up on the mountains, and it does need to be a stop on your tour, but not the only one...This wall is particularly cool in Sirnari, south of Telavi. It is on the main plaza, below the Sirnari Museum. The museum also holds several originals from Pirosmani, the great Georgian painter. Sirnari is a very nice little village, with good restaurants and lodging, but its prices are getting to be a bit high. from the Rkatsiteli grape stock. Looks as rich as it tastes!